There has been considerable interest in light-based control of biological systems, with successful applications that include light-modulation of neuronal ion channels, light-switchable signaling proteins and light-controlled protein targeting, with examples demonstrated in vitro, in cell culture, and in whole animals. Compared to chemical approaches, light-based methods offer titratable, specific, precise spatial and temporal regulation. Most existing examples of light-based control fall into one of two categories: (a) those that are genetically encoded using a recombinantly-produced protein borrowed from nature (e.g. LOV domains), and (b) those created via targeted insertion of amino acids into a protein sequence and subsequent reaction with them of an exogenously introduced photoisomerizable small molecule, typically azobenzene based. Azobenzene and related molecules undergo a reversible cis–trans isomerization when exposed to specific wavelengths of light, and this change in molecular shape can be coupled to changes in protein function. Here, we used a type-b strategy to manipulate the conformation of a supramolecular compex. Supramolecular protein assemblies are attractive materials for engineering nanoscale machines with controllable functions. Protein monomers have been engineered to self-assemble into symmetrical complexes, metal-templated structures and cage-like architectures. The mechanistic complexity of protein machines, however, has made it difficult to engineer assemblies with not only new architectures but also desired functions. 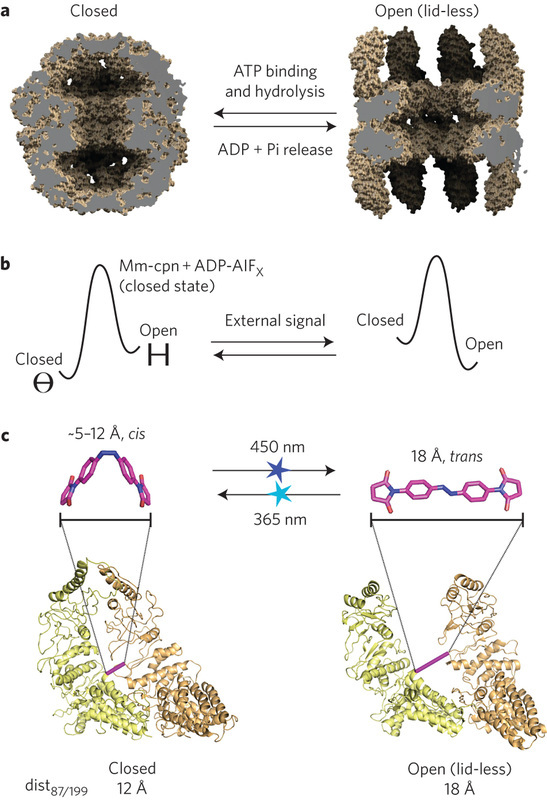 We applied an azobenzene-based strategy to convert Mm-cpn, an ATP-dependent homo-oligomeric group II chaperonin to a light-driven machine that undergoes large-scale conformational changes between open and closed states, as visualized by single particle cryo-electron microscopy. The resulting light-gated nanocontainer can capture and release non-native cargos. The design principle of alternately stabilizing conformational states by switching atomic distances illuminates the cooperativity of evolved protein assemblies and provides a strategy for engineering other light-controlled biologically inspired machines. In this project, we used a type-b strategy (chemical modification, see above panel) in a new way, where changes in protein–ion affinity couple to protein dimerization, in the cell–cell adhesion protein cadherin. By targeting the comparatively-weaker ion-binding sites, this strategy avoids attempting to modulate rigid parts of the protein structure, leading to greater functional modulation. 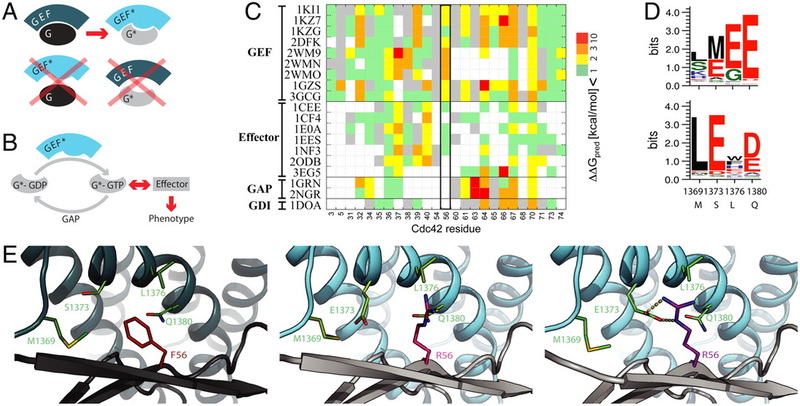 We report an 18-fold change in apparent calcium binding affinity upon illumination, one of the largest fold changes yet-reported for designed photoswitches. Our results include a detailed examination of functional switching via linked changes in Ca2+ binding and cadherin dimerization. This design opens avenues towards controllable tools that could be applied to many long-standing questions about cadherin’s biological function in cell–cell adhesion and downstream signaling, and advances our understanding of how changes in small molecule confirmation couple to changes in protein structure. Signaling pathways depend on regulatory protein-protein interactions, and the ability to control these interactions is critical for engineering biological functions. As many regulatory proteins are composed of modular domains, considerable progress in engineering circuits has been made by recombining commonly occurring domains. Our ability to predictably engineer cellular functions, however, is constrained by the crosstalk observed in these naturally occurring domains. In this work we developed a strategy for improving and simplifying protein network engineering: the use of computational design to create orthogonal (non-cross-reacting) protein-protein interfaces. Signaling proteins often interact with many different partners to perform their regulatory task, and preserving these functions is necessary to prevent pleiotropic effects unrelated to the engineered design. To retain the proteins’ integration into the existing cellular protein interaction network, we designed mutations to affect only the interaction between the two chosen proteins, and not to disturb other known interfaces. We have employed this approach in the successful redesign of the GTPase Cdc42, and its activator, Intersectin. Biochemical assays and the crystal structure of the engineered complex validate our design, showing that the designed GTPase (orthoCdc42) is activated exclusively by its engineered cognate partner (orthoIntersectin). As desired, orthoCdc42 maintains the ability to interact with other GTPase signaling circuit components in vitro. In mammalian cells, its activity can be regulated by orthoIntersectin, but not wild-type Intersectin. The crystal structure revealed an unexpected long-range effect of the designed mutations. We are currently developing computational methods to predict such mutation-dependent rearrangements and thus provide better control over structural aspects of designed proteins. Overall, this work illustrates how computational design of protein interfaces promises to provide specific components that facilitate the predictable engineering of cellular functions.